Usually I set tables for YOU. Whether you're a first-time visitor or a regular guest at Affordable Accoutrements, I value your visits tremendously. Some of the tables I set are for actual dinner parties. One was for Mrs. Rivard, a fictional (or is she?) character from a post I did for "Christmas in July" You can read it HERE. Today, I've set a table for one, for myself, in the upstairs sitting area. It's the same table where Mrs. Rivard dined. 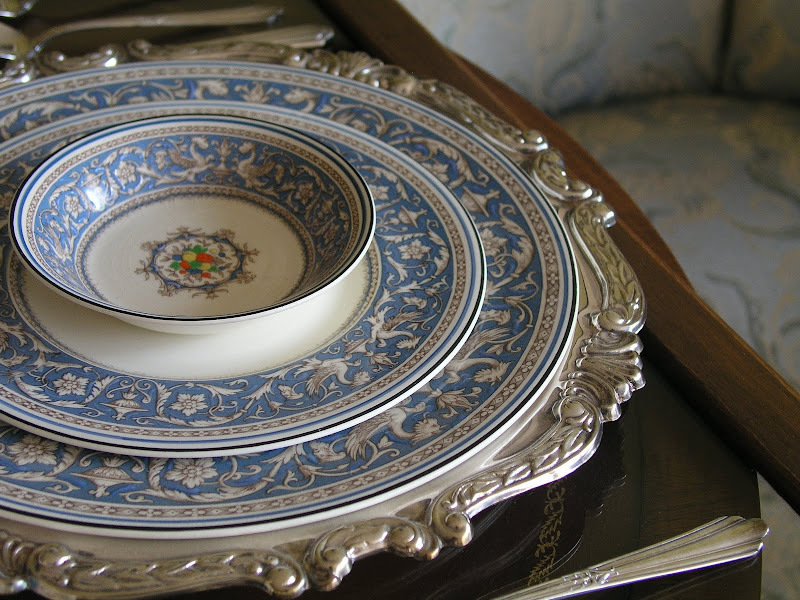 A single place setting can be a happy thing, a special indulgence, but it can also make one wistful, heavy-hearted. I decided to focus on the latter feeling. I usually describe each item in detail and tell you how and where it was acquired. Today, I think there should be poetry. Who better than Emily Dickenson to describe feelings of longing and loneliness? Dickinson had what appears to have been a normal childhood. She was bright, witty, had friends, went to parties ... but by her early 30's began a withdrawal which later became almost complete. There were occasions when even the people she obviously loved had to speak with her from the other side of a door held slightly ajar. While in her early 30's, Dickinson made tentative attempts at having her work published, but it was far ahead of its time and she did not meet with success. Only seven poems were published in her lifetime, each changed by editors to suit the day's standards of rhyme, punctuation, and meter. Side table: Thrift store, $5 (sewing machine table) Shelf inside holds remote controls, etc. 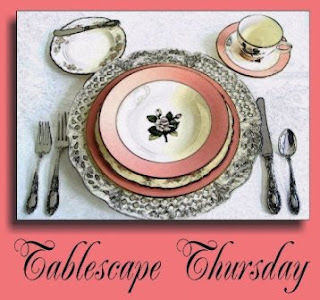 Be sure to visit Susan at Between Naps on the Porch to see all this week's Tablescape Thursday participants. It's always great fun! Thank you, Susan for hosting. Your friend is very talented - you look like you were in deep thought. Bautiful and elegant! Everything is just lovely. I love Emily Dickinson & that is one of my favorites.Your tablescape is beautiful ,also . Great charcoal rendering by your friend. Bill-I am having computer problems, and can't believe I got here. I do remember the Mrs. Rivard post--haunting and beautiful like this one. So many of our talented authors lead seemingly tortured lives and wrote far ahead of their time. It makes you wonder whether such deep thoughts are a blessing or a curse. Your table is beautiful and the dead rose...well, there you have it. Oh... and the drawing is exceptional.... truly Bill! I'm almost speechless. Who would think a tablescape for 1 could be so powerful. The combination of the words, the gorgeous dishes, the dead rose and that wonderful artwork really works. Wow, the poetry mixed with this post made it very powerful. This table set for one made quite a statement too. I really love how the napkin fell over the edge of the table. I can feel your depth in this post. It is SO good to be able to FEEL deeply. Thank you. That drawing is amazing! Your friend is very talented. I love how you used the silver serving tray as a charger. I never would have thought to do that. But I sure will now. How lovely everything looked. You got a deal with that 50 cent candle holder! I love the setting for one, the poem, the china, the glassware, everything is exquisite as we have come to expect from you. Having studied some Psychology I think it has a lot deeper meaning with the charcoal picture of you and you have changed your background to grey ................sending you a hug from the UK, Jackie. I feel as if I just stepped out of seeing an engaging play at the theater! The kind that makes you ponder about it’s meaning long after the curtain is drawn. If a tablescape can be poetry yours certainly has achieved that. Your tablescapes are still lifes and this one is touched with a haunting melancholy beauty. Bravo, well done! Lovely post Bill! I truly enjoyed it and always love hearing Emily Dickenson's story. There are great artists that are trapped behind doors in need of help. Thank you for the great visit! Loved your prev post too. Bill -- I always look forward to your post -- you always overwhelm me with your tables and this one, although for one, does not disappoint! A great table and I love the idea of using silver trays as chargers! How clever. I also have been eyeing the silver napkin ring -- that looks pretty special! The charcoal drawing is exceptional as it captures not just it's subject but an emotion and moment in time. As for your tablescapes, which go without saying are always beautiful, I felt it's emotion as well and as the daylight dimmed and the candlelight became more pronounced it because less melancholy for me. Perhaps because the focus was on the light and the table and not the empty chair. This post was special, Bill. I hope you enjoyed your meal, friend. What a beautiful post. Actually quite haunting. Emily Dickinson is one of my favorites. The china is gorgeous. The charcoal sketch is quite emotional. Good job. As always you have set such a beautiful table, along with a beautiful poem of Emily Dickinson. Her works are among my favorites. I love the table and the place setting. That charcoal drawing is you, and with the poem I see some deeper thoughts here. This was a very stressful time for you I believe. I hope I can give you some encouragement, as you have left for me. Always here for you my friend. Beautiful! Amazing how much alike are Medici and Turquoise Florentine. Similar griffins, similar urns, nearly identical pattern layout. Oh, Dear Bill - you'll pulled at my heart strings with your post. First of all your table setting is so beautiful and nostalgic looking. Your friend is very gifted in drawing the charcoal of you. Oh, Bill, it's so life like and you look so sad. I hope you were just thinking about things. Your portrait makes me want to cry. I hope you're happy today and I would give you a hug if I could. Your picture is a real treasure. It evokes a lot of emotion. I like the dried rose on the table. Dinner alone, love lost, one dying bloom as a reminder. Okay I'm starting to tear up here. Sniff. Time for coffee. You always have the most beautiful of posts. I believe that you could publish a book of poetry and tablesettings -- you capture these moods, well ahonestly to an art form.....truly. That portrait is wonderful -- glad that you said you weren't depressed though -- it sort of makes me hope that she did another one in a more uplifting venue. How remarkable you are -- so glad to have been introduced through Susan's party each week -- haven't we all met the most wonderful sorts of people who's paths we may have never crossed? It is all fabulous... the setting, the poem, the picture. Gorgeous pattern! And love all things Emily Dickinson! A very touching as well as beautiful post. Bill! This is truly breathtakingly beautiful. The photos, the words, the setting, the portrait. All of it. If you don't mind, I may borrow this idea,for a table for one setting, someday. this is STUNNING, my dear, just AMAZING!!!! you can write a book with your beautiful detailed pictures alone, with Emily Dickinson's poetry what a hit! I love where you have placed this little table. The setting goes so well with the rug, chair, table etc. The picture is quite meloncholy in this setting with the poem! This is almost as good as a story! I love it when you do--it is like capturing a moment in a novel. I don't have the right words to express the way I feel about this post, Bill. Maybe saddened somewhat & even a bit tearful? Your portrait pains me & I feel like I want to reach out to hug you. Maybe its because my emotions are so raw over all the sadness in Haiti, day after day. There is a quiet peace about the scene which is soothing, though. I hope you poured yourself a sip of wine & enjoyed a moment of calm before clearing it all away. Your incredible photos, especially the one of the sparkling decanter top & the positively glowing tea candle holder take my breath away. I don't know how you manage to do it, week after week, but you continue to amaze & delight. I'm glad you do. I certainly loved your setting for one. You do a wonderful job each and every time. Your stemware sparkles. I must ask you to share the name of your secret detergant! Your talented friend captured a lot in the drawing. One can only imagine what you were thinking. Exquisite table and poetry choices! You are very talented in your decorating flair and your ability to express the sensibility of your creations! What an amazing piece of art you've put together. I think that for me it was the well thought out touch of a dried rose that really brought the emotion to life. For me that dried rose spoke a true melancholiness for bygone days. Bill your tables are always amazing, but today you captured a mood with the poem, your place setting and your beautiful photos. thank you. This was a very beautiful table for one. I loved the china, and of course the stemware was wonderful. The blue and silver were so pretty together. Thanks for sharing. Exquisite, thought provoking, poignant, are just few words that come to mind. You've presented this one in such an artful way. I like your style Bill; well defined and you take us to new places, new heights. Thank you for sharing. Who doesn't love Emily Dickinson? Had she known you - you two would have been great friends. Love your approach to capture atmosphere in special ways. Love your blog. Bill, This was a very, very special post. Quite emotional. You definitely have the talent, the eye and the heart. Lovely!! Beautiful moody setting Bill. The print is a treasure. I love those chargers!! This is my first visit and I hope you don't mind. I would like to come by. Your post took my breath away. Amazing. Hope to see you at the Vintage Alphabet get-together! Very lovely setting and table. Love that silver charger. Bill, I hope this is just a made up "story" and not your true feelings. Makes me sad. I was single for 16 years and had many a table for one! Not always fun. Such a beautiful place setting for one! Love all the layers and sparkle. Have a great day! As always an amazing post. An emotional but lovely post. How poignant.This post is so beautiful yet pulls on my heart. I love the poem and the table setting, and that drawing of you is amazing. Your friend is really talented. Your table is just beautiful! You captured the mood perfectly. WOW! A museum worthy vignette at Tablescape Thursday. This is truly art. This post should be published in a magazine. It's beautiful. Beautiful. Somedays I think we're meant to be more contmeplative. You certainly captured the mood. Your setting, artwork, and poetry took my breath away. The mood perfectly matches the rainy weather we're having here in SoCal. Your artistry goes beyond the table and reaches into the soul. brilliant! Beautiful and the poetry was a nice added bonus, thanks for the inspiration! My 2nd time joining Susan. I really drools every lil inch of your wares. Heavenly stunning. TY for sharing the ideas. Your table is set so beautifully! I love the elegance of the scape. Enjoyed the poem and the portrait. How original you are to presnt a table setting this way. Thanks for making my day! Your home/dishes are so very beautiful, but the words you use with your table settings are so touching. You have added so very much to the blog world. I love this! I was single for many years after my first marriage and before I met my now-husband and while sometimes dining alone can be a little melancholy...I always thought that it can be liberating too, in it's way! I used to sometimes set up a nice little "table for one" occasionally--not quite as stunning as this one though! And the Emily Dickinson poem was perfect for setting the mood. Hey brother! The table was beautiful, the poem captivating, the picture amazing. See? You surround yourself with wonderful things and we are what we love! Beautifully woven post, the art is wonderful, and your carefully chosen table accents are shown off at their best. 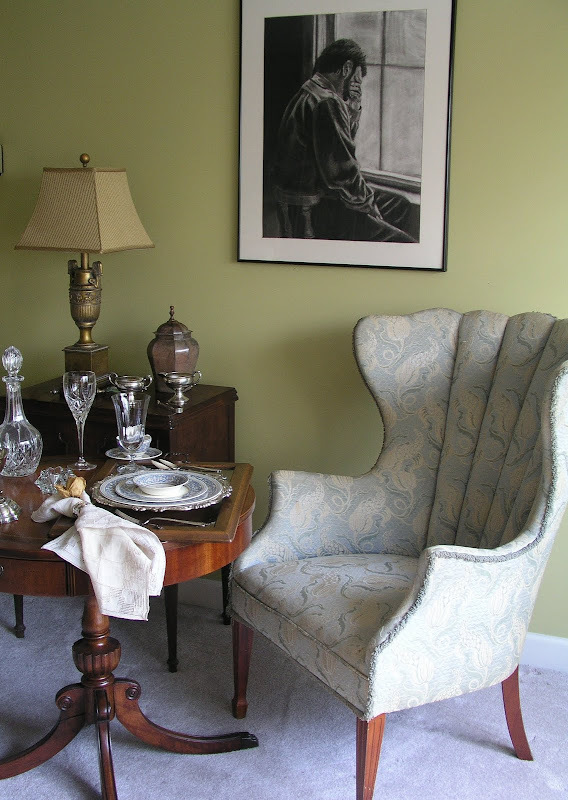 Setting a table for one is a special type of event that deserves the best of attention. Oh my, such a stunning tablescape and the poetry that goes with it, is JUST right. You have a real talent for the settings and creating just the right ambience. Thank you for sharing your table with us. 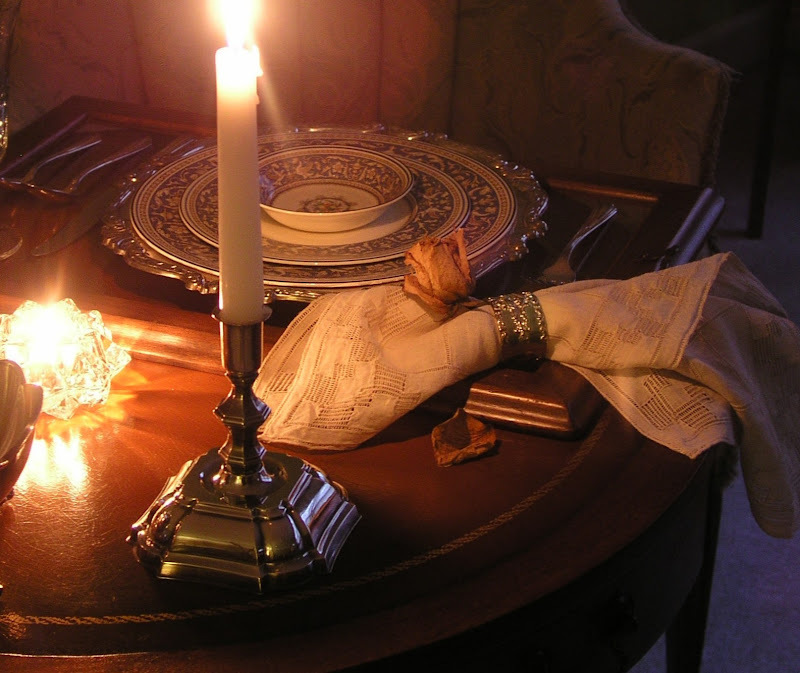 Your tablescape for one is in perfect step with this Emily Dickinson poem, and it's perfect for the yearning, hungering, longing emotions that lay deep inside us. The dried rose with it's dropped curling petal, and the charcoal of you, well, a picture paints a thousand words, doesn't it? It seems strange to call such raw emotion one of my favorites, but this tablescape of yours is one of my favorites. Bill, I go to your post first each week. Poetry, dishes, photos...you've got it all. When can you get a book together? Love the idea of your tablesettings, photos and some of that beautiful poetry out there. Don't stop setting tables---we won't stop coming by! This was just delightful the way you made the two things merge (her poem and your setting) plus, it was a wonderful read! And as always, your pictures are just stunning. But I'm curious. What did you put in those dishes? Certainly not Lean Cuisine! Startlingly congruous - the interweaving of your (may I say) luscious table setting with a haunting Dickinson poem! I might have to stop back in and read further...I feel rather heartened for the day by this. Excellent stuff, thank you. Thank you for sharing a little of you with all of us. ps I still LOVE Mrs. Rivard! I don't know which of your table settings is my favorite so far, but this is towards the top maybe because it is more simple, only one place setting so easier to take it all in and dwell on its beauty! HEY! You didn't notice I have been missing? I have been DELLusional..talking to the tech from behind a closed door, LOL..
Next time I am missing you'd better come looking..hear me..I am whispering...:) I am shy..
With a beautiful arrangement and poignant placing of items, you've made a truly moving interpretation of this poem. Well done.